The Contemporary Art Society exists to develop public collections of contemporary art across the UK. We do so by raising the funds and brokering partnerships in order to purchase, commission and gift works of art to public collections. We work closely with over 64 museums and galleries across the UK that subscribe to the Contemporary Art Society as members. Over the last 100 years we have played a unique and largely solitary role in the formation of public collections of contemporary art in this country, donating more than 8000 works where they are enjoyed by audiences everywhere. Acquired for The Hepworth Wakefield through the Contemporary Art Society with support from The Art Fund, 2011. The Hepworth Wakefield opened its doors to the public earlier this year. This new museum has become the home for an outstanding collection of British art from the old Wakefield Museum and now a major gift from the Hepworth Estate of over 40 of Barbara Hepworth’s plasters and prototypes for her sculptures. Eva Rothschild (born 1971, Dublin) is one of the foremost contemporary sculptors working in the UK today. She has attracted international attention for her work which uses a varied lexicon of forms and materials. Wandering Palm was one of a large number of new works made for Rothschild’s solo show Hot Touch, one of the opening exhibitions at the Hepworth Wakefield. Much of Rothschild’s work has been inspired by modern abstraction however for this exhibition she made a number of key figurative works that acted as pivotal linking pieces within the whole. These works suggest a greater emphasis on narrative than is familiar in Rothschild’s work. Wandering Palm is one of these pivotal works and has been selected to enter the permanent collection for its signficance within Hot Touch, but also for its materiality. The component parts, cast and then assembed to make the sculpture, are familiar objects and it is this very clear representation of process, of casting and making, that resonates in a very interesting way with the existing collection, particularly Hepworth’s hand worked plasters that are on permanent display within the galleries. The strength of this small collection is in the works of the nineteenth and twentieth century British artists, particularly significant is the small cluster of paintings by LS Lowry (see image below). If you have only seen his portraits and seascapes in published form then you may be forgiven for not comprehending quite how powerful these small canvases really are. Elizabeth Magill grew up in Northern Ireland and now lives and works in London. She studied at the Belfast College of Art and the The Slade and has exhibited continuously since the 1980s. At times she has worked with printmaking and photography, but painting is the medium that she always returns to. Rooks is a wonderful small painting, immediately effecting. The use of colour and paint immediately conjures up the experience of land or seascape, we are not quite sure. There is an explicit sense of chill, of sound and of winter’s dwindling light. 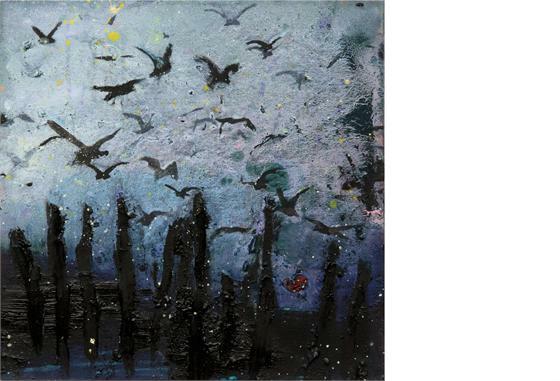 Magill has said of the work ‘I associate a cluster of rooks to the place where I grew up. They would journey overhead back to their nests every evening – their raucous ‘caws’ sounding calamitous. While painting this work I tried to evoke this sound of a collective evening call.’ The work makes a very strong addition to the existing collection and builds consistently on the group of works that the Contemporary Art Society have gifted to the Museum over the years. Rooks will be on display at Sunderland Museum & Winter Gardens in the exhibition Art for Sunderland until 5 June 2012.